Life on the Porcelain Edge by C.E. Hilbert is the perfect example of great comic timing, amazing romance and superior writing skills. This is the story of a woman named Tessa Tarrington who is at her wits' end, thanks to her now having no job, no home, and her life generally spinning out of control. The only way she can salvage her life is by going back to her old high school, and she does so as a teacher. She has no idea that her life is going to take another dramatic turn when she finds out that the boy who once tormented her in high school is now the football coach. When he lost his wife, Ryland Jessup became a football coach at his old high school to feel grounded. He spends his days training the boys and his evenings taking care of his daughter. He had no idea that his life was going to take a new turn with the arrival of his high school crush, Tessa Tarrington. He also had no idea that he still had feelings for her. She is a little reluctant to give him a chance, but soon she warms up to him. But when his best friend with irresistible charm decides to come back home, Ryland now questions everything. Will Tessa give him a chance? Or will she fall for the charm of Joey Taylor? This was a very fun and entertaining novel to read. 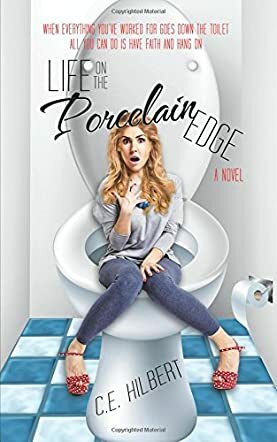 I love romance of all types, so when I got my hands on Life on the Porcelain Edge, I excitedly jumped at the chance to read it. The novel truly lives up to the title and then some. Tessa is hilarious and so relatable; Ryland is fun and definitely a guy that any woman would want. Together, they make a formidable team that is hard to resist. This novel had me on the edge of my seat, smiling, biting my nails and rooting for these two. This novel is simply so entertaining and enjoyable. Life on the Porcelain Edge by C.E. Hilbert is a contemporary Christian romance novel that would appeal mostly to a primarily Christian audience made up of mature young adults and adults. Tessa Tarrington used to be a ghost writer until her anonymity is ripped away and her father’s declining health pulls her back to Gibson’s Run, Ohio where she finds herself becoming a substitute teacher at her old high school. Everything would be fine if it were not for the fact that she had sworn never to return to the high school due to the bullying and humiliation she had endured there. Her first day on the job finds her confronted by the boy, now man, that bullied her during her childhood. As a child, Ryland Jessup decided he was going to marry Tessa Tarrington, but one misconstrued warning and some bad jokes landed him with the title of bully. Now that Tessa is back, he is determined to make it up to her. Will Tessa and Ryland make peace and find love, or will Tessa find herself falling for her old crush? Life on the Porcelain Edge by C.E. Hilbert is a well written book that did a wonderful job of linking the past and present together through a series of flashback memories. I loved the way the author worked Tessa's and Ryland’s childhoods into the book as I found it interesting that they both saw the same events so differently. From the beginning, I was all set to hate Ryland, right along with Tessa, but as I read on I began to see things from his side as well as Tessa's, and I was just sad at the number of misunderstandings that happened between them during their childhood. Overall, I really enjoyed reading this book and I would love to read more by C.E. Hilbert! Life on the Porcelain Edge by C.E. Hilbert tells the tale of Tessa Tarrington. She’s lost her job, through no real fault of her own, and that means no roof over her head. Her dad is ill, so she heads home to be near him, soon getting a job as a teacher at her old high school. It would be fun, but Ryland Jessup is there, and Ryland is not someone that Tessa wants to be anywhere near. But, the man that was once a high school bully has changed beyond all comprehension and it doesn’t take long for him to worm his way into her life and her heart. Following his wife’s death, Ryland is now coaching the football team at the school and bringing up his daughter. But, just when he thinks he is winning Tessa over, his best friend reappears, an irresistible man who has women falling at his feet. Will Ryland win this time, or will Joey take the prize once again? Life on the Porcelain Edge by C.E. Hilbert is a great story, an easy read that whiled away a few hours on a rainy day. The story was well written with lots of surprises along the way, some that you really couldn’t see coming. The characters are wonderful, developed really well, and written in a real-life way that lets a reader identify with them – and I’m sure all of us can find at least one character we identify with in this story. Ms. Hilbert has a wonderful way with words, a way that draws a reader in and keeps them hooked to the end. I thoroughly enjoyed this story and look forward to reading more of her work. Tessa Tarrington is experiencing the worst time of her life. She’s just lost her well-paying job and residence. Now she is living in the bedroom she once used as a child. But things get even more complicated because her father has also suffered a heart attack. Determined to get a grip on her life and take control, she accepts an offer to teach at the high school where she studied. But here she meets the guy who once was her arch enemy, a bully in those days eight years ago; Ryland Jessup. Ryland has had his own share of pain, losing his wife and having to look after his daughter alone. He is back at the high school to coach the football team. Things get interesting when the two begin to feel a great connection. But then Joey Taylor, Ryland's attractive friend, comes back onto the scene. The rest of the story is what the reader has to discover for themselves. Life on the Porcelain Edge by C.E. Hilbert is a gripping romance with memorable characters. One of the things that had me fascinated is the conflict. We are introduced to the protagonist in a crisis moment of her life and the reader becomes very keen to discover how she’ll navigate the turbulence. The author allows the characters to evolve naturally throughout the story without slowing down the pace. The characters are real and readers can so easily connect with them. This isn’t a run-of-the-mill romance with a predictable plot, but a story that has originality, with powerful literary elements integrated into the plot — suspense, irony, and symbolism. Life on the Porcelain Edge features great prose, interesting characters, and strong plot elements, and C.E. Hilbert comes across as a master storyteller. Life on the Porcelain Edge by C.E. Hilbert begins with very interesting facts about one of the key characters, Tessa Tarrington. Her life is in the toilet. Having lost her job and with a father suffering from a heart attack, how can she help when she now lives in her childhood bedroom? The narrator says her life is swirling "in the bowl, just waiting for the ultimate flush." But Tessa is a fighter and will look for ways to get back on her feet, which is why she takes up a teaching job at her Gibson’s Run alma mater. The only problem is that she would be meeting her worst enemy, Ryland Jessup, the bully, who now returns to the school to coach the football team while raising his daughter. But eight years have transformed the once over-sized bully into an attractive man who seems to quickly get into Tessa's heart. But when she begins to open her heart to him, his best friend resurfaces. Could there be any hope of Ryland and Tessa together with Joey Taylor now in the equation? C.E. Hilbert’s novel is a wonderful read, a story with a great plot and solid characters. I enjoyed the way the characters are explored and, instead of becoming a distraction, the backstory gives flesh to the plot and makes it more interesting. The writing is wonderful and readers will love the vivid descriptions and the charm in the plot. The story has great pacing, intense and emotionally charged moments, and surprises that readers won’t see coming. I found Life on the Porcelain Edge to be a great piece of entertainment.